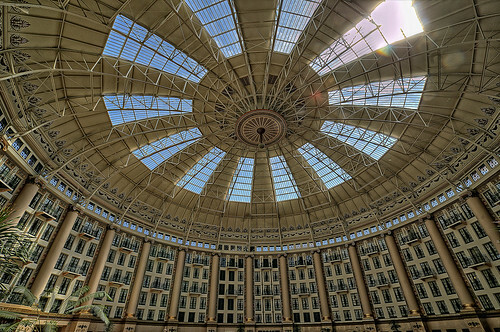 This week’s photo of the week is a High Dynamic Range (HDR) shot of the dome at West Baden Springs Hotel, in French Lick, Indiana. Lucas Windsor has some other fantastic HDR shots in his collection. (If you’re curious about what makes a photo an HDR one, check out this wikipedia link, luckily, you can still enjoy the beauty of this picture without understanding HDR). If you’re looking for a romantic weekend getaway, why not look into this beautiful newly-renovated hotel or it’s ‘sister’, the French Lick Resort. In addition to the beatuifully restored architecture, French Lick boasts a casino, spa and both Donald Ross and Pete Dye-designed golf courses. If you’re more intersted in a family getaway, French Lick is still the town for you. Stay at the brand new Valley of the Springs Resort, which features a water park for the kids.